Today’s graphic comes from AlphaCore Capital LLC, a registered Investment Advisor from La Jolla California, and has been put together by Jonathan Belanger, CFA, the Director of Research. It was intended to show that using average returns is not an appropriate approach to working with alternative investment strategies. 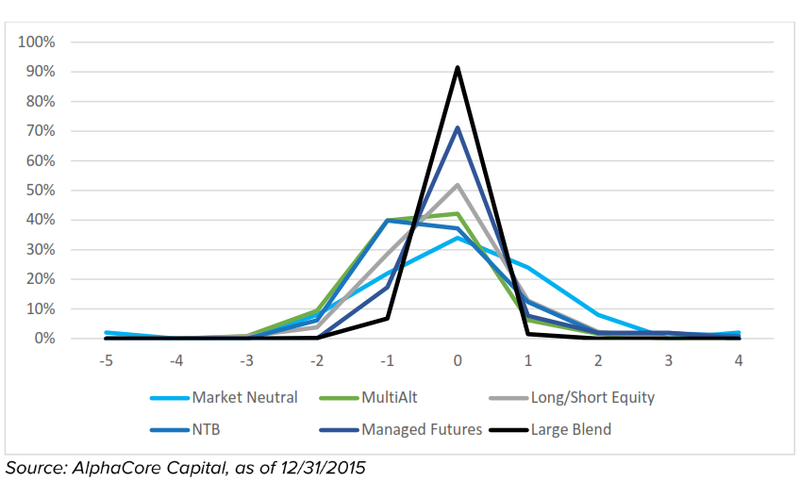 The graphic shows Sharpe ratios for alternative strategy mutual funds for 2015 in Morningstar categories. The categories are Market Neutral, Multi-alteranative, Long/Short Equity, Non-traditional Bond, and Managed Futures. For reference and benchmarking the Morningstar category Large Blend is included to typify large-cap equity dispersion.